0,5 liter German Panorama Beerstein with solid pewter lid. Limited Edition of 5000 pieces. The Westerwald area is renowned for the quality of its substential clay deposits, its extensive forests and its reservoir of highly qualified potters. For many hundreds of years these factors have contributed towards the production of valuable stoneware products which have brought fame and prestige to the area for centuries. The family owned company Zöller & Born was founded in 1956 by Alois Zöller and Werner Born. To follow up the long tradition in the Westerwald area we started production of beer steins of high quality which are created with great care of genuine stoneware. The complete development of new models is realized by highly talented designer artists employed with the company. All relief steins, the speciality of Zöller & Born, are handpainted and have a valuable pewter lid to make them attractive collector's items. 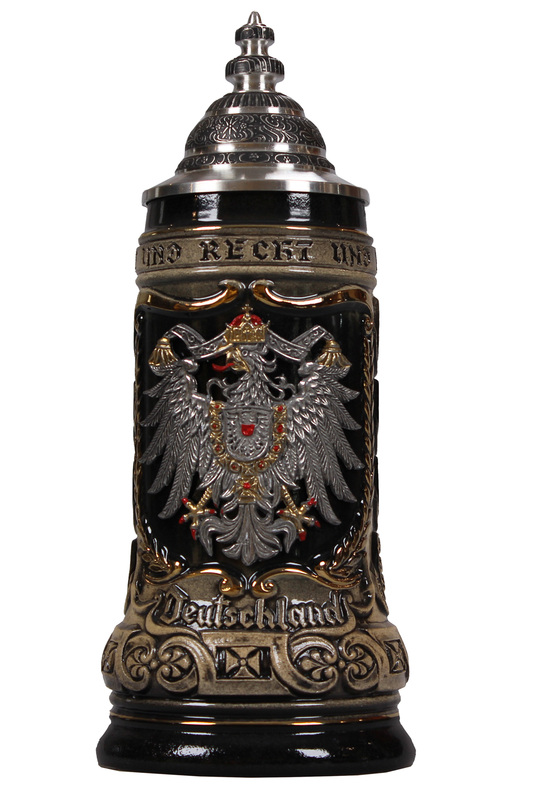 Zöller & Born supplies beer steins world wide into more than 30 countries i.d. 35% export rate. Made in Germany is an obligation to us and we therefore guarantee to only sell products of best quality.